My favorite pizza dough! 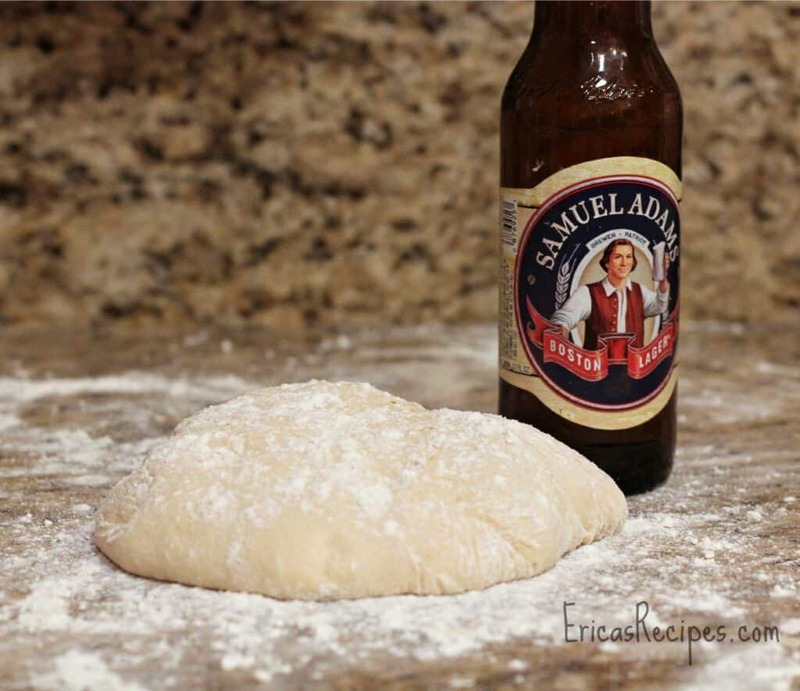 Sam Adams Beer Pizza Dough is SO flavorful and hoppy and just the best thing ever. You’ll find on my blog, that this is my go-to pizza dough, and I love the flavor that it adds to all my crazy pizza ideas. Oh yes I did. Made pizza using beer. If there’s a way to work beer into a recipe, I’ll do it. I’ve brined with it, made barbecue, bread dip, sandwiches, crepes… I’ve even stuck it up a chicken’s rear-end. And now I’ve made pizza with it. If you hear a sense of pride in my writing about this, you would be correct. Friday night is generally pizza night in our home, and this is taken pretty seriously. At least by me. Sometimes it’s ordering out, and sometimes (oftentimes) it’s using a purchased crust. But every so often I make the dough, and those nights are extra special. I’ve always made a Whole Wheat Pizza Dough that we absolutely love, but I wanted a basic white dough in my arsenal too. The beer is just a special touch. Sit the beer in a bowl full of hot tap water. Let the beer warm up so the yeast will be happy. In the bowl of a stand mixer fitted with the dough hook, add the beer and yeast. Let yeast proof 5 minutes. Add the honey and olive oil. With the mixer running on "stir", add the flour and salt. Knead the dough 10 minutes. Cover the bowl with a double layer damp paper towels and put in a warm place for the dough to rise ~1-1/2 to 2 hours (I blast my oven for 2 minutes, turn it off, then stick the bowl in there). Turn the dough out on a floured surface and divide into 2 portions. Knead each 10 times to get it good and elastic. Put the pizza stone in the oven, and heat oven to 450F. Heat another 15 minutes to ensure the pizza stone is fully heated. While the oven is heating, the dough will rise a bit more. Using a rolling pin, roll out one piece of dough into a 12- to 14-inch round. Move dough to the pizza stone and add toppings. Bake at 450F for 15-20 minutes until crust is cooked through. Yield: dough for 2 pizzas. As the hubby’s bagel dough rises I find this….my two fave ingredients of life, pizza and beer. 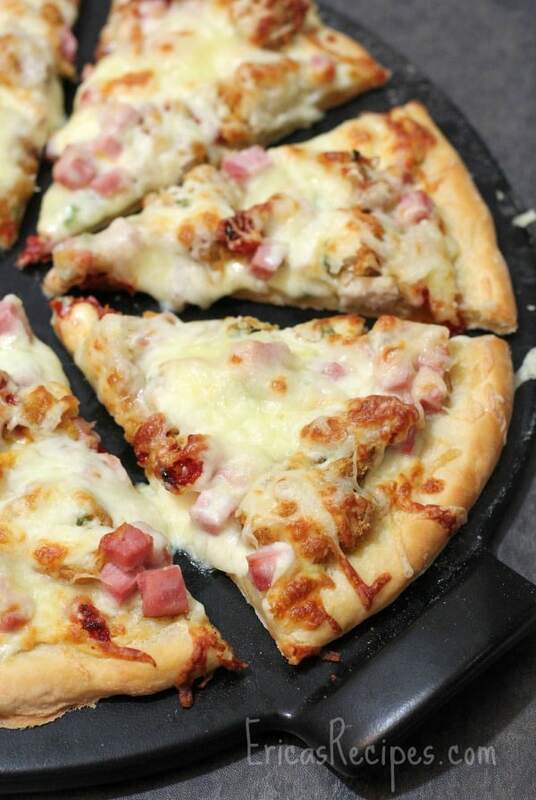 This is the best pizza dough recipe! My husband and I have been using this recipe for two years and have experimented with a variety of their (Samuel Adams) beer. Mmmmmm…. !